We can integrate interlocking brick and pavers into your landscaping. Are you looking to build a beautiful new outdoor living space? Maybe it's a firepit for the family to enjoy or a new outdoor cooking area? Maybe even a new pool deck? Interlocking bricks or pavers are a stunning landscape feature when they’ve been installed by a professional and they offer many years of service and low maintenance requirements. From a simple interlocking brick patio off the back of your home to a sprawling interlocking brick driveway there are many possibilities. Irreco LLC is a full service landscaping contractor based in St. Louis, MO. 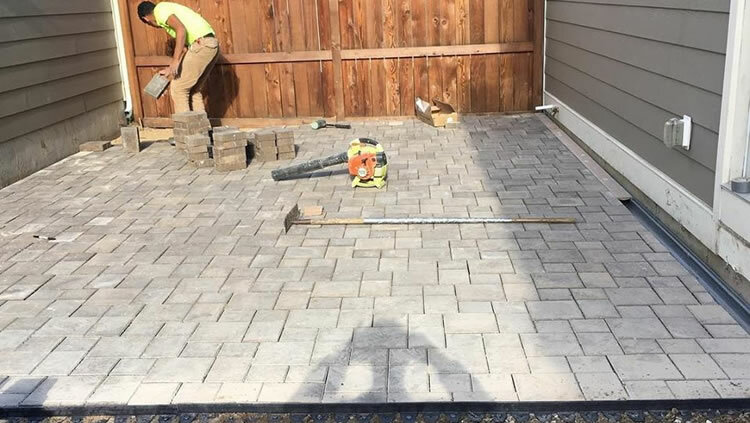 We specialize in incorporating interlocking brick, paver, and stone landscape features such as brick patios, walkways, outdoor cooking areas, driveways,and more. We determine how the surface area of your project. We consult with you on the specific brick materials you’d like. We’ll get to work on the schedule start-date and build your brick landscaping features. The end result will be a beautiful new brick patio or driveway on your property. The amount of work required for this type of landscaping project can vary greatly from property to property dependant on many factors. The slope of your property, drainage, size and scope of the project will all be considered. We’ll be able to offer you an accurate estimate only after an initial site visit and material consultation. Why Choose Irreco For Brick Landscaping? We understand that you have many landscaping contractors to choose from throughout the St. Louis Metro. We just want you to know that when you choose to work with Irreco you are partnering with a small, locally owned business that has many years experience implementing interlocking brick into the landscaping of St. Louis properties. If you’d like to get the process started then please give us a call 314-246-0099 or fill out our online contact form and we’ll get back to you right away (usually the same day). We can then organize a time for one of our landscaping experts to visit your property and assess it, take accurate measurements, answer any questions you might have about incorporating interlocking brick into your landscaping and then provide you with a competitive estimate for your project.